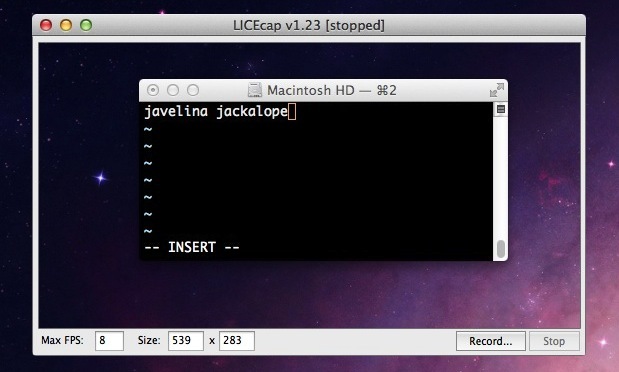 LICEcap is a screen recording app that captures a portion of the Mac OS X (or Windows) desktop and saves it directly as an animated GIF. Incredibly simple to use, the apps functionality should be familiar enough to anyone who has used screen recording with QuickTime before, except that rather than a movie being exported, you wind up with a GIF. If you’re looking to record your screen and export the recording as an animated GIF with very little effort, give LICEcap a try, it’s quite good and being free means it’s just a matter of downloading it and seeing if the app is right for you. Launch the app, then drag the recording window to the region of the screen you want to turn into a GIF, size the recording window appropriately, choose a frame rate (8FPS is the default and reasonable), then choose “Record” to start. 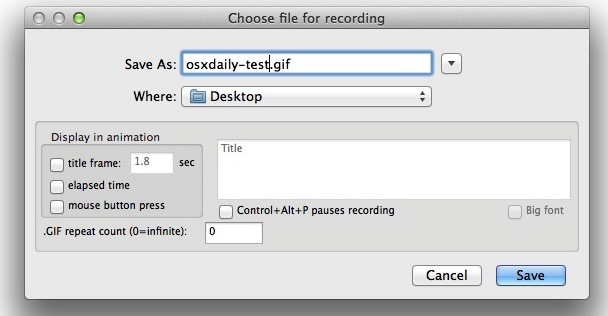 After you click “Record” you’ll be presented with a simple file save dialog of where to send the screen recording GIF to, which also provides some additional options for the recording, able to set an intro title frame, record mouse presses, show the elapsed time, and determine whether the GIF should repeat or not (the default is set to repeat). The only real weakness of LICEcap is that it can’t access the menu bars, meaning it isn’t able to record the entire screen or menu actions. By the way, if you do plan on recording animated GIFs for use on the web, be sure to grab ImageOptim as well to compress the file size considerably before uploading them to anywhere, it works just as well on gifs as it does on PNG and other formats. This is perfect for what I was looking for. I used to capture screenshot as GIF with Acethinker Screen Grabber, free and works like a charm as well. Share it here as an alternative to LICEcap.